Bags, Puffiness, and Dark Circles…the three things you see when you look in the mirror! That sounds like something the Great Karnak would say. At the same time, it could be our daily reality. Ladies, the only bags we want should be like this one, not like these! What are the causes of these three unwelcome maladies? From as young as puberty collagen production begins to slow down. Very soon our skin is, in reality, breaking down that plump layer we once had and lines become visible without replenishing collagen. What can we do about Bags, Puffiness and Dark Circles? Vogue Effects have sourced naturally occurring marine collagen which when applied to the surface of the skin will restore superficial collagen, increase moisture retention, elasticity and density of tissues. The addition of Oat peptides in our formulation improves pro-collagen synthesis, helping to plump the tissues, reduce wrinkles and restore the skin’s natural moisture barrier which also reduces inflammation. Licorice, Seaweed, and Vitamin C increase skin brightness and luminosity even decreasing unwanted pigment deposits in the skin. Each eye mask contains soothing 24k gold, plumping collagen, hydrating hyaluronic acid, refreshing vitamin c serum, anti-aging seaweed polysaccharides, brightening licorice extract, moisturizing oat peptide and calming rose essential oil. Free from parabens and alcohol. I tried it, I liked it! 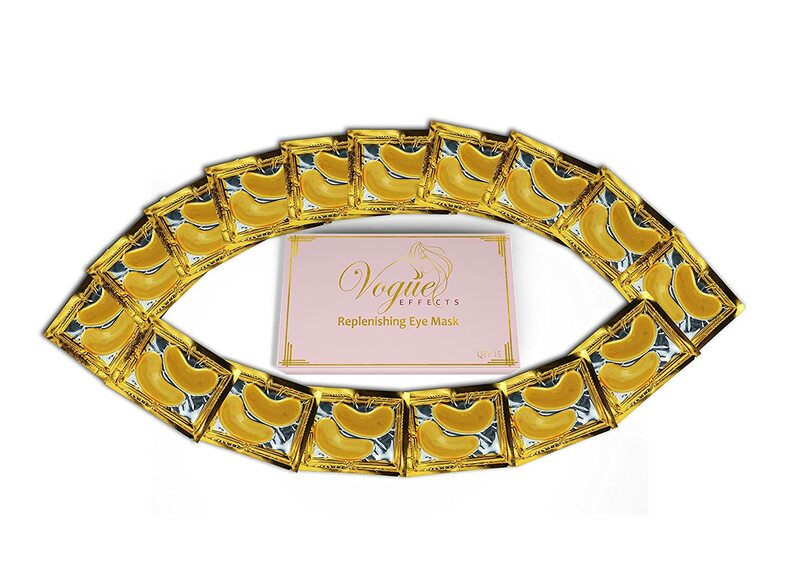 I purchased a box to try out and I must say the 24K Gold Eye Masks by Vogue Effects have reduced the puffiness and tighten the skin below my eyes. I received a lot of compliments from my friends and coworkers! These eye masks are an inexpensive alternative to higher cost treatments to reduce bags, puffiness, and dark circles, you get 15 pairs, so it might be worth your while to try them out! Thanks for the review. I think i would like to give them a try! Letie, Like I said in the article, they are a more economical alternative in order to extract our inner beauty! Please let us know how it went. They are trending right now! I have never heard of using gold quite like this. I am going to have to try it! I am not as young as I used to be and I am starting to see the puffiness and lines show up more now. When I don’t sleep good or I am overstressed, it really shows a lot under my eyes! I was actually looking around for something I can get to help so I am glad I clicked on this post. I like that these aren’t like the typical creams and serums you see for under eye issues and the fact that they are individually wrapped means it will keep fresher longer. Let us know how it went with you.